You'll be hard-pressed to find a used Mascot Reel Mower for sale, because this workhorse of a mower is built to last for decades. In fact, the silent cut mower was recommended to us by a landlord who uses one to mow multiple lawns every week. 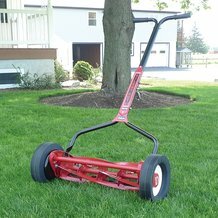 Heavier than other reel mowers, its solid 12-gauge steel frame plows through grass and won't bounce over weeds and bumps in your yard. 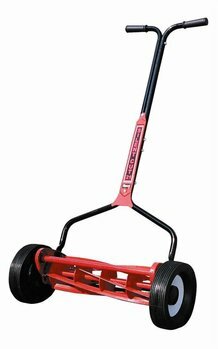 Mascot 18" Cut Mower-Adjustable single piece poly roller, cutting height adjusts from 3/4" to 2-5/8". 18"W cut, overall 25"W, 41 lb. Mascot 21" Cut Mower-Adjustable three-piece poly roller, cutting height adjusts from 1" to 3". 21"W cut, overall 29"W, 50 lb.